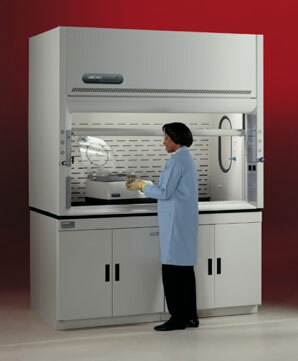 High-quality fume hoods are paramount to your lab’s safety. Fume hoods are commonly used to protect from toxic fumes, radiation and other hazardous materials. Depending on the intended use of your lab, we can provide fume hoods specifically built for those purposes. Whether you’re running RNA gels, radioactive assay production, or dealing with other caustic and potentially harmful substances, we’ll make sure your lab workers’ health and safety are always protected. Providing quality fume hoods in Seattle & Bellevue. Laboratory Design & Construction represents Labconco and BMC for all your fume hood requirements. High Performance General Chemistry Hood – A broad ranged, general purpose fume hood designed to protect the user from toxic fumes and vapors. Our high performance models are more energy efficient than a standard general fume hood. Bypass Hood – Bypass fume hoods utilize an internal bypass opening allowing a constant exhaust volume while maintaining the face velocity regardless of sash positioning (open or closed). Variable Air Volume Hood – Variable Air Volume (VAV) hoods allow for flow control with fast, stable adjustments over large flow volume. The pressure-independent system maintains steady flow through filter changes, system adjustments and HVAC degradation. ADA Fume Hood – The ADA Fume Hood is able to provide all of the same options and features to a wheel chair or sitting-height technician. There is the added convenience of everything being in arms reach. Pass-Through Hood – Pass-through hoods allow access from both sides and may be installed in the wall between two rooms. Demonstration Hood – With all four sides constructed of safety glass, this type of hood is commonly used in educational institutions to allow students to easily view the teacher’s demonstrations inside the fume hood. Walk-In Hood/Floor Mounted – These general use walk-in fume hoods can accommodate larger equipment (barrels, carts, etc.) and provide adequate product manufacturing areas. Radioisotope Hood – Radioisotope hoods are constructed specifically to protect users from radioactive substances. They are also crafted to withstand the weight of lead shielding plates. Filtered Hood – A multi-use fume hood utilizes high performance filters to provide protection without requiring ductwork installation. Other Special Application Hoods are available to meet your labs’ specific safety requirements. Contact us for more information about Fume Hoods.